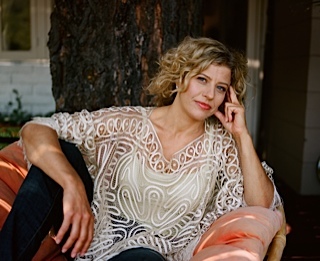 Birth of the One-Minute Memoir! Our first writer, Kimeiko Vision, at the Writers On Fire booth. Be The Change, 2014. Las Vegas, NV. That’s right. The 1-Minute Memoir. Move over Book-In-A-Weekend. Sayonara Book-Proposal-in-a-Week. We’ve distilled the critical art of the personal story into the second hand of a stopwatch. We’re back. 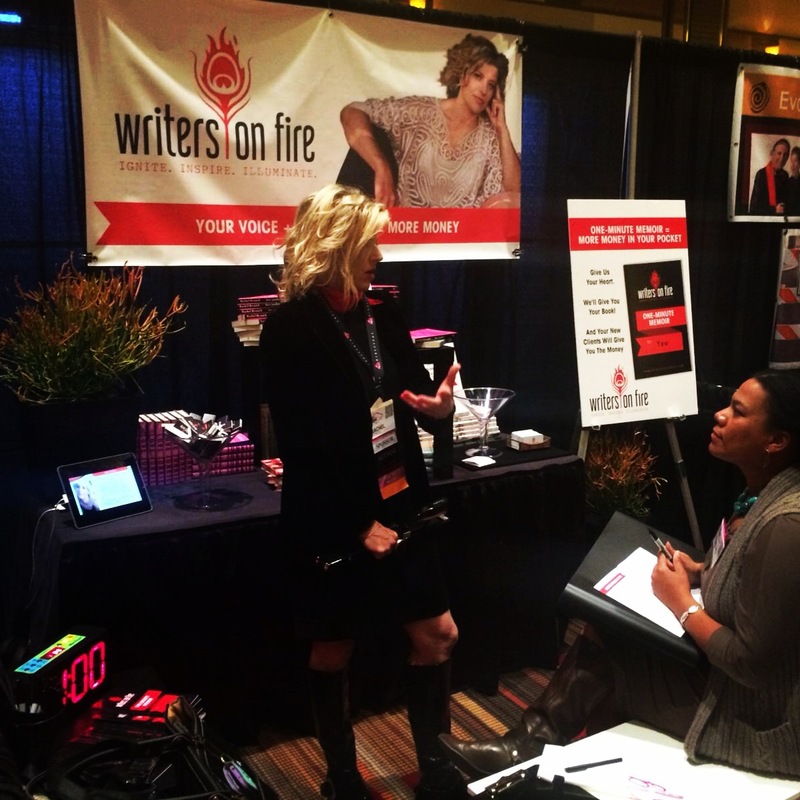 Fresh from Suzanne Evans’s powerful Be The Change Event in Vegas where we busted our sponsorship cherry and launched our experiential Writers On Fire booth. The lovely Paige Rolfe, our branding stylist and creative director, ushered conference goers into our booth. Then I gave instructions. After they finished, we took photos of the writers with their completed memoirs. Gave them their booklets to take home. The gracious Diana Needham helped them with closure on the experience and gave them an opportunity to book an appointment with me to continue the conversation. She kept the flow going. That doesn’t tell the story though. Something happened when people entered our booth. Something shifted. Never mind the conference was packed with 800 people. Inside our booth, the vibe was hushed. The atmosphere deep. The energy intimate. We’ll give you your book. Each person who entered, who opened themselves, added that possibility to the space. You could feel it. Over the four days, the space got stronger. Beware ye who enter. This is the power of intention. I made sure to be present with each person, as best I could. We asked them to read the instructions. Some got it right away. I could see something rise to the surface. It showed in their eyes. Others, I moved in close and I read the instructions to them. “Think of it like a bedtime story,” I joked. Looked them in the eye. So many had trouble staying present. Their eyes would dart away. Or they would stare at the ceiling. Through me. Over my head. Anything but connect. Often times I would touch the person on the arm. Anything to connect. Then I’d see it. Something would rise up. Fill their eyes. Their bodies. And they would be ready to write. We set a bright neon sports buzzer to one minute. People sat on a bench. Or a chair. They wrote. Many cried. Neighboring booths kept lending us tissues until we got wise and brought down a box. So many of us have stories inside. Stories that need to come out. Stories that are strangling us, or making us stuck — or sick with secrets. Sad stories. Angry stories. Shameful stories. I think people could tell — could feel — that I didn’t judge. We three all gave them permission to bare themselves. They didn’t have to show me what they wrote. They could, if they wanted. I read many. Such stories. So much challenge. So much courage. I wept with many of our visitors. Our writers. Our fearless entrepreneurs and conference goers. Do you want to succeeed? Do you want to be your best self? Do you want to rewrite your own story? Then you must access your story. Through the heart, not the head. You must express the story with your authentic voice. This will free you. This will clear the way for you to share your journey with others. If you want to be a leader, then you must understand your own personal story. Your journey. Including the dark parts. The low points. The things you don’t want to tell. You must learn to be intimate with yourself. Only then can you be intimate with others. Only then can you connect with people. Your clients. Your prospects. Your family. Connection is what it’s all about. This is the modern world of business. It is about relationships. It is about offering experiencse. WELCOME! THIS IS YOUR LIFE! TAKE A SEAT. SET THE TIMER. TELL YOUR TRUTH. Tell the story you don’t want to tell. The real one. The one that makes you blush. Or cringe. Or quake. Write the moment you f*cked up. Or the instant your life chnaged. And you made a decision you could never take back. Tell us how you turned it all around, and became You. Today. Give us your Raw + Real. Your heart. Your blood. There you have it. Now — will you take the action? Will you go there? If you’re good, we’ll give you 2 minutes. Even 3. No more. The timing, the frame, the ticking clock and then the buzzer — that is what makes this deep dive possible. Free your mind. Unleash your 1-Minute Memoir. I cannot wait to hear from you about your experience. From Scarecrow To Artist-Saved-By-Systems: Step Up Your Business With Systems + Speaking! What If Speaking My Truth and Sharing My Personal Story Might Hurt Someone? What an honor to get such a juicy response from none other than the magical maestro of copywriting and messaging herself, Lisa Manyon! You have made my day and beyond. “Elevator pitch” certainly seems played out. A relic from “Mad Men.” Thanks for your comment and gold seal of approval! I hate Mother’s day…I didn’t have a nurturing mother. So this was a great prompt. Thanks Rachel. Hi Michele! Oh. Do I hear you. And feel you. So glad this was a great prompt for you. Thanks for the feedback. Let us know if it flows into a story you will now share, on page and/or stage. Or perhaps it just needed to be voiced, and can be kept for you. I can feel the authenticity and emotional power in your writing. Truth shimmers. It has a quality, an energy — that cannot be faked. Thanks Michele! myself and others will make the story real, vibrant and alive. Hope to see you soon! 9 years ago I made a decision to create a business that made a difference to the lives of women. I wanted them to feel beautiful, feel like they mattered, to feel like they could show up. I had no qualifications, no industry experience or status in the business world. Three businesses in and I’m creating a life that I love, a business that allows me to live with passion and purpose while inspiring other women to have the confidence to be successful in business and in life, to have the courage to stand in their power and inspire those around them to do the same. Rachel, you have truly made me understand the real power of story and it’s place, no necessity, in business. I love the simple structure you have laid out here and am certainly trying it out. Bravo as always!! !